I couldn’t resist this. Hell has frozen over! Yes, the little town of Hell, Michigan is in the grip of the polar vortex (town sign also frozen over). Are you a ‘shoot first, ask questions later’ type of trader. Or are you a ‘I need to see absolute proof before I make a trade’ trader? I confess I lean towards the former style and that means I sometimes get in too early. That is the cross I must bear. But using my risk management rules, the losses on too-early trades are small. But then, when I eventually catch it just right – it’s away to the races. All previous losses are swiftly recovered and I’m in net profit. But it takes much patience – and eternal vigilance – to pursue this strategy. If you are an impulsive ‘gambler’ type, this will not appeal. But I would encourage anyone to cultivate a more patient and watchful approach. We all know the old proverb: ‘When at first you don’t succeed, try, try again’. It sounded great when you were young and impressionable, didn’t it? Later in life, you learned its obvious retort: ‘Madness is trying the same thing over and over and expecting a different result‘. The world is full of dilemmas and contradictions – just like the markets! But in the world of trading financial markets, if we are lucky, we can have a time-proven system in our armoury to analyse them. I have my Tramline Trading method. I had been studying the Orange Juice market late last year. Yes, this is a small futures market that has been traded in NY for many decades. It was the market highlighted in the wonderfully funny 1983 film Trading Places. They were betting on a freak Florida freeze that would send the market skyrocketing. And they got one. 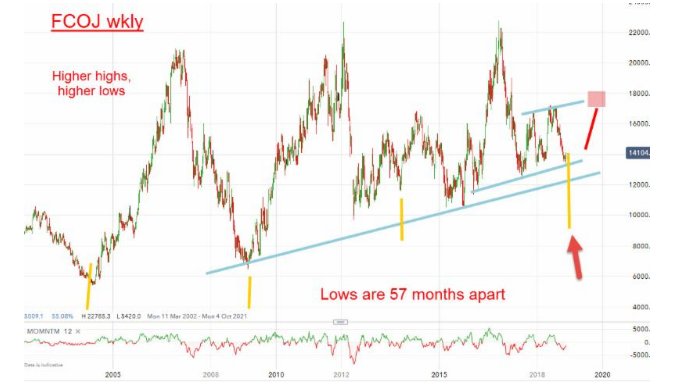 The major lows marked by the yellow bars are approx 57 months apart (not quite a round five years). Isn’t that curious? And this month lies right on the latest yellow bar. So if the cycle remains valid, we should expect a substantial rally phase this winter season. The market was historically cheap near $1 per lb so I figured the downside was limited. But I recognised I was performing the dreaded ‘bottom-fishing’ exercise. Of course, this is heavily discouraged usually by those financial advisors who have no clue how to go about it scientifically. But I do. 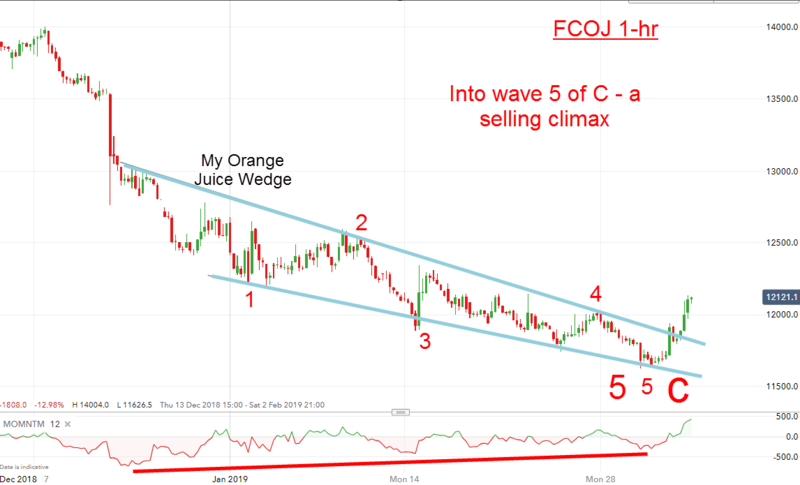 That is why I advised VIP Traders Club members to engage in a bullish FCOJ Frozen Concentrated Orange Juice) campaign in November that could last several weeks at least, perhaps months. But sadly, my first two efforts failed and resulted in losses (small). I got in too early. 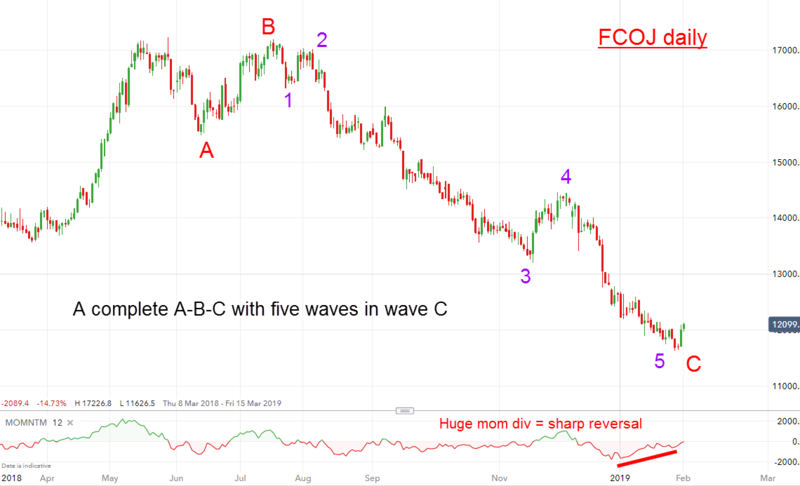 The best fit is a three down with wave C with a potentially complete five down to a huge momentum divergence. As you know, this is my ideal recipe for a stunning reversal, which seems to have started. When the market touched the lower wedge line last week, I was on high alert of signs the reversal was at hand. And I didn’t have to wait long – on Thursday, the market shot rapidly up to the upper wedge line and yesterday, punched clear of it. Naturally, a long bear market draws in many shorts that have seen major profits accrue. As the market declined, these shorts grow ever more confident in their stance and at a major low, their bearish sentiment reaches an extreme. And that is when just a few shorts who decide to take some profits can move the market up substantially. So far, the polar vortex that is producing record low temperatures in the Mid-West has not touched Florida, but the season is young! In any case, I am not banking on a major freeze to produce my bull market – I believe the waves are lining up to do that anyway. 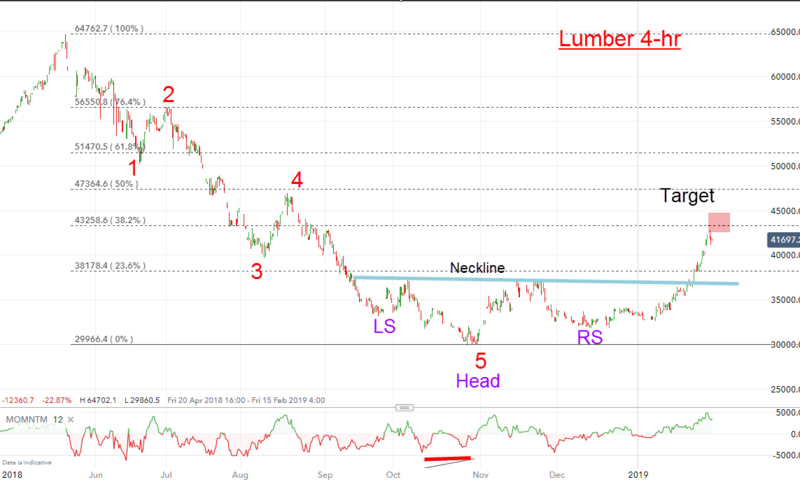 The market has surged through the H&S neckline and reached the measured target also at the Fib 38% retrace. Nice. It may have further to run but taking profits of 110 big points appears prudent here. For a modest £1 per point bet, that is a profit of £11,000 on a margin of $1,000. 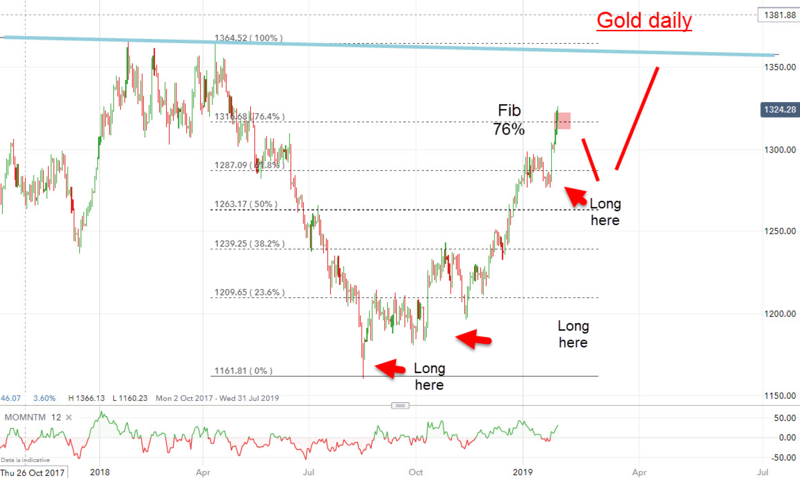 We have been riding the gold bull since last August and have added to positions on the way up. But all good things do come to an end – at least temporarily.. Last week I advised VIP Traders Club members to prepare for a correction and to take some profits if desired. I have been noting a lot more bullish gold articles lately – and coming after a strong bull run, this always makes me very nervous. The little guy is getting sucked in again at a top. That is the feeling I always get in such circumstances. And as the market corrects, they will get under water – and sell out at a loss thereby adding to the overall selling pressure. It works time and time again. That is the reason I read the MSM – not for priceless words of wisdom, but to gauge the overall sentiment prevailing. It is a truism that markets always top out on high bullish fervour – never when sentiment is dark. And the reasons for being bullish there make a lot of sense. It’s just that the timing is all wrong. There are two main parts to successful trading/investing. the first is to get the trend right. Will it go up or down (or sideways)? Many can achieve this task quite consistently. After all, a glance at a daily chart should reveal the dominant trend (if any). But correct timing – ah, that’s a horse of a different colour! That’s where the vast majority of people fall down. And that is why I was determined to master that aspect and that is why I developed my Tramline Trading system. Last week it reached the Fib 76% retrace and into overhead resistance. The DSI bullish count has pushed up to the 80% region where previous highs were recorded. Also, there is a budding momentum divergence which is a major factor in expecting a downturn soon. But this correction will be a pause in the main uptrend. My main target remains the upper blue trendline in the $1350 region. 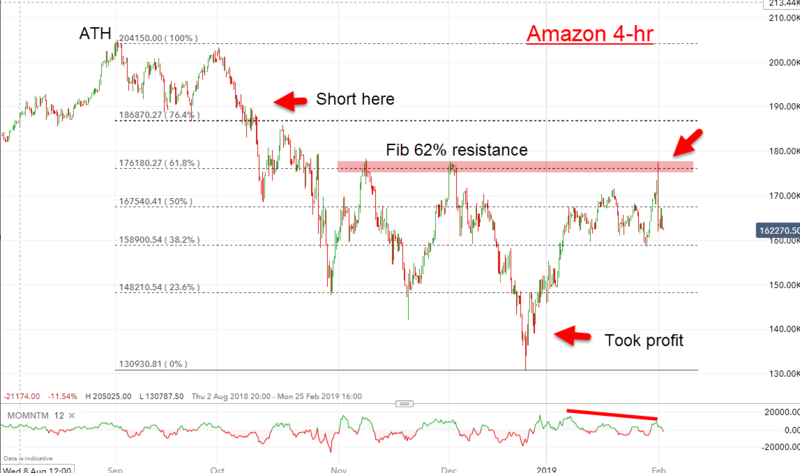 Blowout Amazon results – yet the stock sank 5%. Why? In a stunning vindication of my thesis that earnings do not drive stock prices, Amazon shares spiked higher on Thursday pre-results as word of the better-than-expected earnings leaked. But just as rapidly they plunged in a ‘surprise’ move. As you know, I always expect relief rallies to carry to the Fibonacci 62% retrace in preference to all others (except possibly for the 50% retrace). And guess where Thursday’s spike high carried? Of course – to the precise Fibonacci 62% level! Note that this resistance level had been established before on the two previous major highs in January. It was always going to be major resistance to rallies – and an ideal place to short. Having this insight before the results could have prompted you to set a limit sell order at around $176 to fade any possible rally on the results. And what a trade that would have been! It closed yesterday at $162 for a loss on the day of 5% and a daily range of a massive 9%. For one of the largest cap shares on the board, that is stunning. So can anyone tell me that earnings matter? After all, it reported earnings of $6.04 per share, beating street estimates of $5.68 per share, according to Refinitiv. Of course, the pundits ascribe the collapse to Bezos’ weaker forward Q1 guidance. Not so. In a bull environment, such concerns would have been ignored and the shares would have maintained their advance. But in today’s bear market environment, investors are looking for any rally to sell into – and they did just that last week. Take a two-week Free Trial to my VIP TRADERS CLUB. Details here. Or take a three-week Free Trial to my PRO SHARES service. Details here.